The leader in eReading technology is Amazon, as they are the innovative company that invented this category with the first Kindle eReader five years ago using e-ink technology. Today ebooks are mainstream and are available at your local library. Amazon reported in May of 2011 that digital book sales have now surpassed print sales. What is surprising is that women are driving the sales of ebooks, not geeks, this seems like a logical extension since women are heavy book readers. The ebook format is based on Adobe’s e-pub format which is basically a PDF with a few added extras. While this technology seems excellent for books that are black and white, it may not be appropriate for magazines as it lacks the interactivity that may be required in the future as video, photo slide shows and pop-up ads are added to the mix. Also the file size of a colour magazine takes too long to download in a PDF format. The launch of the Kindle Fire Tablet has changed all of this as this seven inch Android tablet enables you to download both Android (now called Google Play) and Kindle Apps to the device for magazines in addition to books. The apps still need approval from Amazon to be included in their App store for this device. The Kindle Fire tablet is not available in Canada at this moment, but it has been estimated that Amazon has sold over six million devices in the 4th quarter of 2011 at a price point of $199 versus 13 million iPads. While Apple dominates, Amazon is a formidable competitor that must be reckoned with, and six million users is another market magazine publishers will want to target their content to that skews women. with an easy to use interface. It has a 1 GHz dual core that provides decent download speeds, it is not ultra fast as there was a one to five second delay when I was surfing on the web. But what you can download on the device is pretty impressive; Amazon boasts you can download 20 million movies, TV shows, apps, games, songs, newspapers, audio books, magazine and docs. I could not download any apps in their app store as it is not supported in Canada yet. You will also get storage of all your purchases on the Amazon servers as a backup i.e. the Amazon cloud service at no extra charge. This is a seven inch touch screen , so content will have to optimized to read on this device. Most websites I visited reverted to the mobile version which made it easier to read. 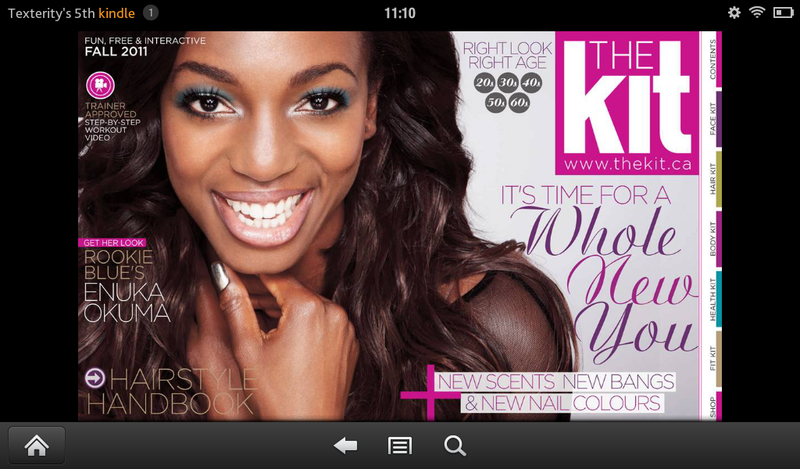 Our experience at Texterity to deal with this issue was to adapt our smartphone app for the Kindle magazine app . The seven inch form factor is a very convenient size and when I used it to read my email it was no problem at all, buy typing without mistakes required me to go to landscape mode due to my big fingers. As I mentioned in an earlier blog post, this is my favourite size for a mobile device, it was big enough to read on and I can hold it in one hand. the market leaders in the digital magazine space in North America. 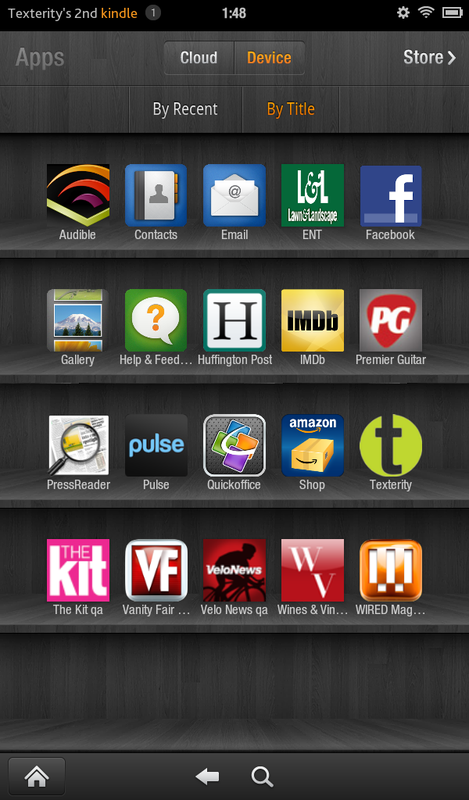 The home screen has been customized to provide a uniquely simple user interface. The menu bar has a Newsstand, Books, Music, Video, Doc, Apps and Web as the navigation bar commands. 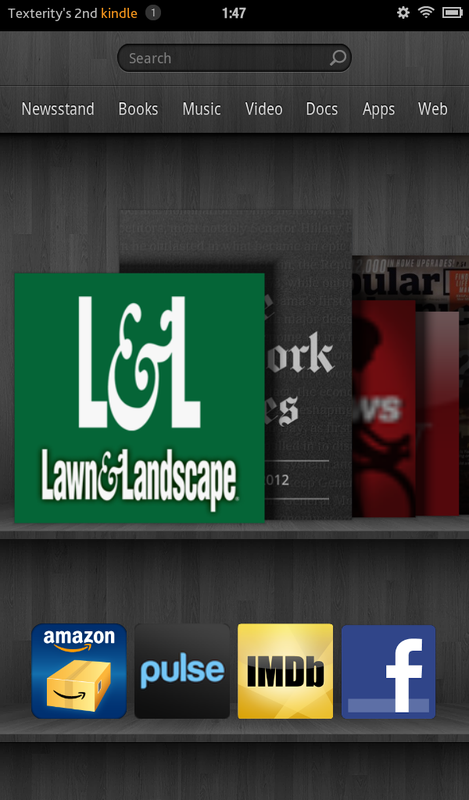 There is easy entry into the Amazon store when you are in the Newsstand, Books, Music or Video section. As with all devices there is a new learning curve with each new device, but Amazon is making this very user friendly. The price of $199 is what the market wants right now and the rumour is that Amazon is using this as a loss leader ($18 loss per device) to generate sales for their products. The tablet does not come with features like two camera lenses that raise the cost to the consumer, so this is a single purpose device. It has a USB port and the battery life is excellent lasting (two to three days) when I was just checking email and web surfing. The sales were so successful that Apple started saying in the press that they are coming with a seven-inch model themself. Note: Technology companies usually revert to FUD (Fear, uncertainly, doubt) a ruthless tactic to prevent sales of competitor products. This is Amazon’s 4th generation reading device, it was not over engineered with features I will never use and it was well priced at $199. There are rumours of a 10-inch device in the works. But as with all devices, the first generation ones always has bugs and I discovered one when I was traveling to Calgary for the Alberta Magazines Conference this March, as it did not work with the Toronto’s airport wifi system and kept on crashing the device. Ryan Winsborrow from Nerds for Hire also said that it needs volume controls as part of the hardware design, but there is however volume controls in the video player software. So Amazon has still not created a perfect device in the eyes of this reviewer, but is pretty darn close. Lastly, I invite you to attend the Canadian Association of Journalists conference this April 27-29 at the Fairmount Royal York Hotel in Toronto, where I will be moderating a session called State of the Magazine Industry – What Journalists need to know to succeed. The panel will include Brandon Kirk, vice president of Corporate Sales, Rogers Publishing Limited; Brenda Bookbinder, vice president of media investments, Novus Canada; Lynn Chambers, group publisher, TC Media; and Martin White, consultant – online magazine marketing. State of the Magazine Industry – What Journalists need to know to succeed. This session will provide journalists info on the market forces that are shaping the fast changing magazine industry. They will require new skills in the future for social networks, websites, digital magazines and video in addition to print. We have gathered four industry experts to help journalists see the big picture from a variety of perspectives: the needs of a small magazine, the challenges of a successful print franchise in the women’s service category, what the ad sales people are doing to generate revenue and lastly what the advertisers want.